In this case study, Brenda Rigney, Earls Kitchen + Bar’s Vice President of People Operations, gives an inside look at how culture, brand, and leadership can impact the bottom line. Our aim on this initiative was to create a clear culture that links to business strategy, foster and create an engaged workforce, and take a stand for leadership. Therefore, beyond building a business that we’re proud of, we see our partners (our term for “employees”) thrive and become a leader in their life, and, ultimately, we become a top career destination for young people in North America. We’ve been measuring engagement for over 12 years and when we missed making the Top 50 employers category in 2012, it prompted us to take a look at what we stood for. Our engagement at head office was dropping 50 percent year-over-year and company engagement hovered around 70 percent. What we weren’t looking at was participation rate. Of our 5,000 partners and leaders, we had less than 30 percent participation. If we were an employer of choice, we needed to capture at least 65 percent of people in the survey. Over the years, we’ve heard from people in and out of Earls that our culture is unlike any other. We have something special that others do not. But if it was so special, why were we still seeing declining sales and eroding profits? We also made a commitment to shareholders that we would expand the brand to the U.S. How could we enter the U.S. without engaged people in our talent pipeline? We realized our language was broken, we were unsure of our purpose, and our culture was unclear—all of which led to mediocre results. We needed to unify generations of Earls language it into one common language and ensure that they were integrated into daily routines so that every partner and leader would be speaking the same language. 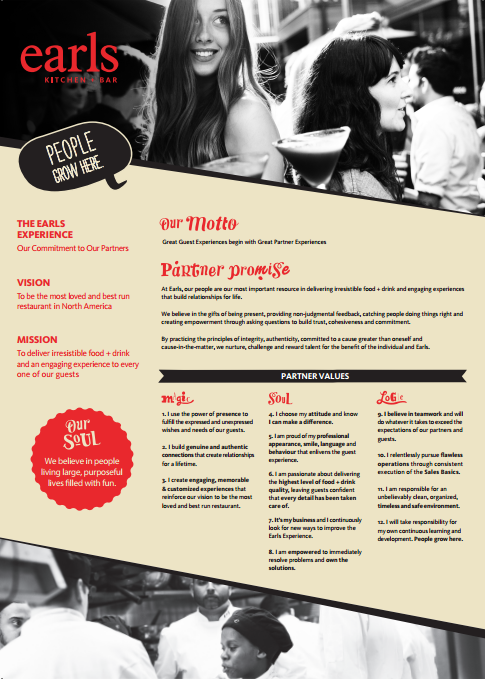 We laid the foundation of a strong culture that we call the Earls Experience. We ensure our partners are supported with shared values (partner values), that empower them to make decisions and take actions that are aligned with the brand. This shared and common language activates our partners with concepts they own, bring to life and take responsibility for. The Earls Experience is our culture and is what sets us apart from our competitors. Our strategy is built on this and it’s used to filter our decisions, build our leadership programs, and guide our roles and KPIs. Dynamic and engaged leadership: Our partner values are modeled, coached, and expected at every level in the company. We are powered by our people and we operate using a “bottoms-up strategy,” welcoming feedback and innovative ideas from the frontline. Living values: During daily pre-shifts, leaders will set up their day and night teams with one aspect of the Earls Experience. These meetings provide a daily opportunity to share and ensure alignment with our business strategy, showcase expected leadership behaviours, and strengthen cooperative and trusting relationships; all of which ultimately spread the culture of Earls and ingrain the values behind the Earls Experience. Shared language and consistent messaging on our mission, vision, and partner values are also woven throughout our printed materials (e.g. company posters, partner value pocket cards, and cube) and in our intranet portal, myEarls. 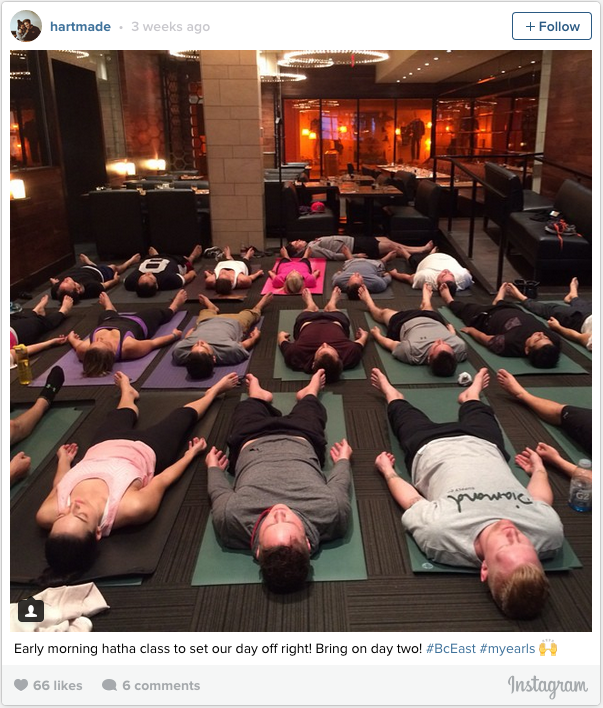 Even our president, Mo Jessa, shares his thoughts on the Earls Experience, blogging about his own leadership journey on myEarls and LinkedIn. In addition to learning and living our shared values, we also needed to clarify our purpose and be clear about what we believed in. People are the heart of the business and what we want for them is to live large, purposeful lives filled with FUN. 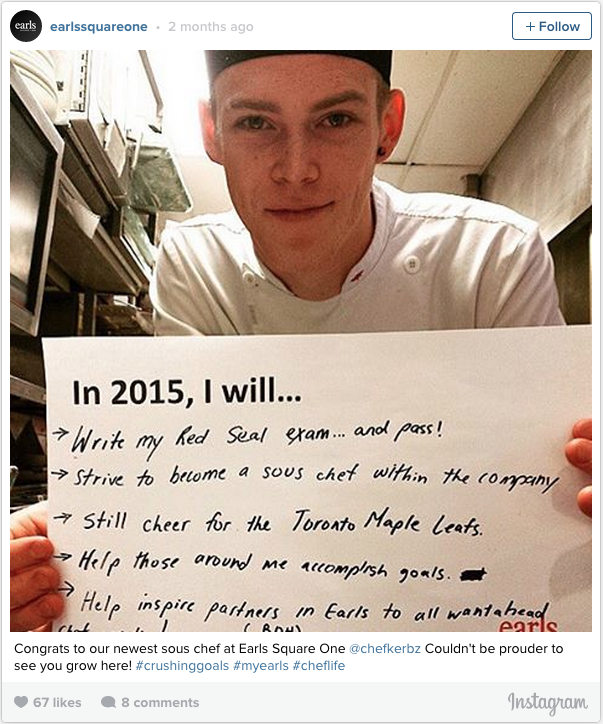 This is our company’s soul and that soul is embraced and embodied by each person at Earls. Responsibility and accountability: Our company philosophy, “It’s your business,” encourages responsibility, accountability, entrepreneurship, and ownership. Since Earls started, a sign of a good general manager or head chef was their ability to hire and develop a high performing team. Yet this was never measured. While we measured engagement, we never held leaders accountable to their level of engagement in the restaurant. We made a significant shift in how we held our leaders accountable to their business and how we made leader promotion decisions. We began measuring our leaders accountabilities in this order: selection, development, engagement, sales, and profit. To be a purposeful organization that was living our soul we needed to back it up with how we measured these accountabilities. Celebrating success and failure: Instead of annual performance reviews, we value frequent informal feedback conversations, identifying what went well, areas for improvement, and what resources are needed for further support. We also celebrate success by giving gratitude, recognizing our peers with #EarlsKudos on social media, and rewarding people for a stellar job at annual company award events. We encourage failure because we learn and grow from it every time it happens. We’ve taken a stand for being about leadership first. Everyone is expected to own, develop, and exhibit leadership behaviours. We believe in leadership at all levels and that leadership is a choice for everyone in every moment. At the start of 2015, we began offering leadership development courses to our hourly partners. Typically, in our industry there is only an investment into technical training in order to execute job responsibilities. No matter what their role or title is, we want all of our people to have access to learning and leadership in their life. We challenge them to find their own self-balance and explore how they can be their best selves. There are four leadership commitments that are the foundation for our leader’s success: integrity, authenticity, being cause in the matter—Earls’ terminology for identifying opportunities, taking responsibility, and being accountable for finding a solution—and being committed to something bigger than oneself. Leadership commitments are taught through our leadership programs, vision and goals, leader’s gifts, leading teams, and being a leader. Our commitment to leadership reconnects us with living into the Earls Experience in every moment and interaction. When leadership becomes a self-expression, that’s when a movement of inspired leaders begins. At Earls, we believe great guest experiences begin with great partner experiences. Success for us depends on engagement and the partner experience. We measure employee engagement, leadership, enablement, alignment, and development. We seek feedback frequently because the feedback drives our strategies. Past survey feedback has contributed to company initiatives and helped to improve processes and systems related to: training, development, and compensation and benefits. Using a next generation “People Intelligence” survey platform by CultureAmp, Partner Experience surveys are conducted company wide in the fall and spring. In between these periods, short pulse surveys can be done to select groups in the business that may have low engagement so that we can quickly identify issues in order to improve engagement and effectiveness. Engagement is critical for our business. The mobile-friendly platform collects data and allows us to review feedback in real time so that we can drill into problem areas and determine what specific strategies will boost happiness at work and ensure our people feel heard. We’re big on giving gratitude and recognizing our people. We invest time in growing leaders through teaching and developing leadership at all levels in the company. 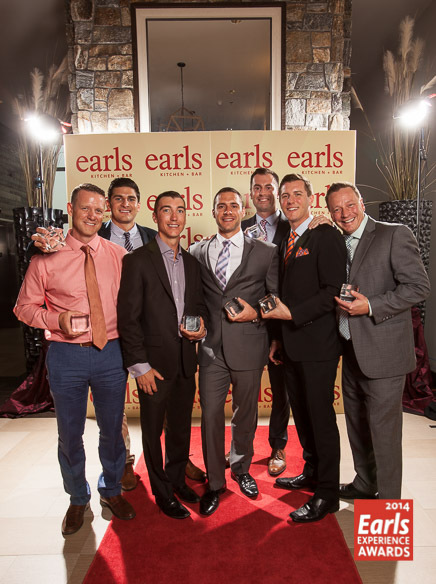 We reward leaders at the store level through the Earls Partner Awards. Our head office awards recognize partners and leaders that have done exemplary work, all while embodying our partner values and leadership commitments. And, our Earls Experience Awards recognize our operational leaders for leading the company in key operational metrics and for exemplifying our partner values and leadership commitments. These awards events all further connect our people to our culture and strategies. Our people have a big voice. They’re living into the Earls Experience each day and are amplifying this message on their personal social media channels. We’ve laid the groundwork by enabling advocacy through our Earls Wants You social channels: Twitter, Instagram, Facebook, LinkedIn, and Glassdoor. We also have a social feed in myEarls that pulls in all posts tagged with #myEarls, #EarlsLife, and #EarlsKudos so that at any time, examples of the Earls Experience can be shared moment-to-moment by people across the company. We share interviews with our people, showcase what others are doing to mobilize culture and leadership at the store level, and feature our people living into their goals. We’ve hosted Tweet chats, held a Periscope session with our regional leaders, and selected leaders to be social ambassadors who take over our social media channels for one week to highlight what’s happening in their store. In April 2015, our work on powering our employer brand was featured by Recruiting Social. In June 2015, our engagement survey practices and its impact on how we connect with our people was talked about in the Wall Street Journal. In July 2015, Bersin by Deloitte published a case study on our journey to business-embedded HR. We’re speaking about how we mobilized the Earls Experience and are creating an inspired and engaged workforce at the 2015 LinkedIn Talent Connect Conference in October 2015 and the HCI Talent Acquisition Innovation Conference in November 2015. We have been seeing an increase in interested candidates from our activity on social media and sourcing candidates through LinkedIn. We need the data to back this up. An ATS would have provided us insight into where candidates were coming from and drive our strategies to amplify our recruiting and branding efforts. Employer branding is still seen in a corporate perspective. 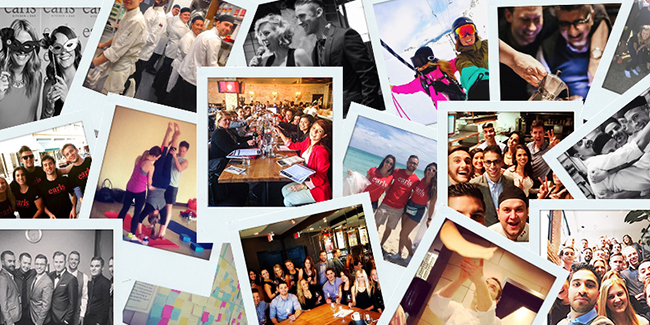 Advocacy will trump everything when our people say this is the greatest company to work for. We need a way to objectively assess candidates coming through our ATS with candidates ready for internal promotions. We need to measure them with the Earls Experience to ensure there is a good match with our culture and leadership commitments so that we elevate our talent pipeline. Align the company on its vision, mission and values: Everyone has to speak the same language in order for a vibrant culture to live and thrive. Weave culture throughout the organization and ensure it lives in your people, product, services, and communications. Motivate and measure your people against how they model the company’s values. Measure alignment and engagement often. Be agile so you can make adjustments to impact your team and culture. Invest in leadership development at all levels of your company: Everyone should be exposed to developmental opportunities that enable them to exercise effective leadership. This also helps with promoting leaders within the business and maintaining a talent pipeline. Be clear about responsibilities and accountabilities: Be clear about expectations and what people are responsible and accountable for. Measure them against the accountabilities and recognize them when they succeed. Motivate your people to be advocates for your employer brand: Culture thrives and attracts new talent when your people are sharing their experience with the world. Encourage your people to share how they live and interpret the brand’s values. Equip them with tools or training to boost and amplify their message on their social media channels.